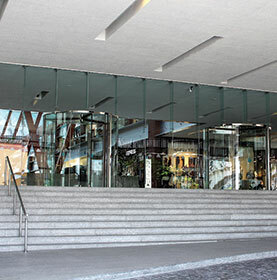 Mesmerising lifestyle centre in Veracruz, México uses customised revolving doors to win a daily battle against wind, heat, humidity and air conditioning leaks. Since opening in October 2014, Andamar Lifestyle Centre struggled to contain strong Veracruz winds, which consistently left its swinging doors open and exposed the facility to heat, humidity, and sea breezes. In turn, this allowed the shopping centre’s air conditioning to escape, resulting in a second challenge: higher electricity expenses. Andamar Lifestyle Centre is home to over 100 different stores spread throughout the nearly 2 million square feet of retail, restaurant, and leisure space. Taking the mall’s estimated 5.3 million annual visitors into account, and the fact that 40% of them are entering through the main entrance, the air infiltration and loss situation became unsustainable. As a result, Rosa María Bueno, director of Andamar, began looking for solutions. Two important factors the centre needed to consider were the location and use of each door. In addition to its main guest entrances, Andamar has entryways to its terraces and ocean views, which are primarily used by waiters in transit – making easy access a must. “Because we’re beside the ocean, many people go outside to enjoy the air, take photos, and eat; as a result, waiters go in and out with their hands full of food, huge trays, etc. We needed to find the right entryway that wouldn’t make this process any more difficult,” Bueno said. Andamar also had to consider its original architects’ opinions. “The architects who designed the centre were very worried that the new doors would change its visual design and obstruct the ocean views, two important points that were taken into account from the beginning. After a detailed search, we found the ideal solution with Boon Edam,” the director said. In total, the shopping centre installed eight Boon Edam doors: three Crystal TQ automatic revolving doors, three Crystal TQ manual revolving doors, and two Crystal BoonAssist semi-automatic revolving doors. With the help of AVANCE Inteligente, a local door installation company, each door was installed with the specific entryway’s purpose and location in mind. Bueno affirmed that, in addition to receiving a customised analysis, the shopping centre experienced nonstop assistance and dedication from Boon Edam support staff during the project’s duration. This led to the right solutions, and gave the client complete confidence in the quality and adaptability of Boon Edam’s team.